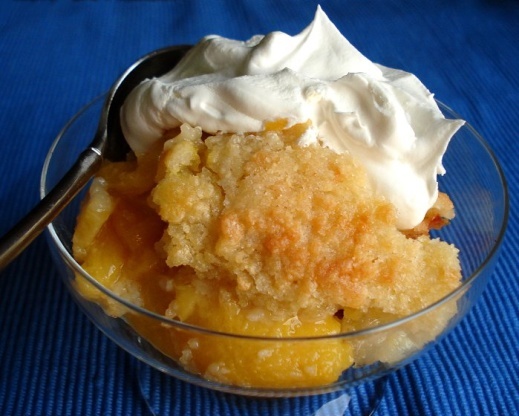 Making a Dutch Oven peach cobbler was a favorite of mine growing up. I remember looking forward to this delicious treat on each campout with the Boy Scouts. However, I also remember trying to find ways to avoid cleanup because the bowl and spoon that we used to mix the cake batter was always such a mess. Then, I learned this simple recipe from "Skinner"...a REAL LIVE chuck wagon chef! He showed me how he uses the fruit can to cut the peaches into smaller sizes. And, he showed me how to make this recipe without mixing the batter first and messing up bowls and spoons. I was skeptical at first but this recipe really works! It's delicious! And, it is so fun to mix and match fruit, cake mix, and soda to come up with tantalizing new concoctions! Start with a clean Dutch Oven. Empty peaches into Dutch Oven. Using the can or jar, cut the peaches into smaller sections. Using your fingers, pull the peaches one finger's width from the side of the dutch oven. Add yellow or spiced cake mix and spread level. Use a fork to break the lumps. Add Coke pouring from the outside to the center. Place Dutch Oven on top of 15 coals. Place 10 more hot briquettes on the top and bake for 20 minutes. Note: Vary the fruit, cake mix, and soda pop to come up with your own flavors. For example, a spiced cake mix will give a breakfast flavor. And, Rootbeer is really delicious. Super yummy! For conventional oven, follow the same procedure. Bake at 350 degrees in glass or clay; covered for 15 minutes and then remove the cover for last 5 minutes. Serve with ice cream or whipped cream and Enjoy!! !